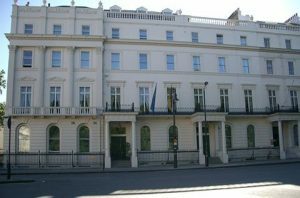 Considerable restoration work was being carried out by the main contractors and our client, PAYE Stonework & Restoration Ltd to the German Embassy in Belgrade Square, Belgravia, London. This included extensive external stonework restoration and internal works. Tapco HomeDry we instructed to quote for damp proofing to some of the old thick walls that were being affected by rising damp. Following their instructions our qualified damp surveyor inspected the property and tested the walls of concern, using a hand held Protimeter SurveyMaster damp meter, in surface (measure) mode to record the levels of damp affecting the internal wall surfaces. Our detailed report together with our floor plan and recommendations were submitted to our client for their approval. Following their instructions to carry out the treatment, our fully trained operatives attended the property and carefully drilled a pattern of holes, horizontally, to the base of the chosen mortar joints, Vertical holes were the drilled at the end of each line of treatment, all the walls were cleared of dust and injected with a Silane/Siloxane cream damp proof course at the approved rates, to allow a spread and form a new damp proof barrier to prevent further rising damp. Because the Embassy is a listed property the holes were then filled using a lime mix, ready for the main contractor to apply new external render and internal plaster coats in accordance with the building inspectors instructions. Damp proofing carried out by Tapco HomeDry at the German Embassy is covered by our established 20 Year Guarantee, which for our clients piece of mind, is protected by Guarantee Protection Insurance (GPI). We have been established since 1971 and have not only carried out damp proofing for many of London and the Home Counties main contractors but many thousands of private home owners who now have a dry home. We are long term members of the Property Care Association (PCA), Trust Mark (Government Endorsed Standards) and an approved Which? Trusted Trader. There is only one way to eradicate damp and that is properly so do it once, do it right and use Tapco HomeDry to preserve your property for many years to come. During our 46 years of trading we have carried out successful damp proofing to many thousands of commercial properties and even more domestic properties, from the smallest of flats to the largest houses. We have thousand of guarantees that expired many years ago but the properties remain dry so be safe, call us first.